From the report view page, click on the drop down arrow on the “Run Report” button, and select “Schedule Future Runs...”. 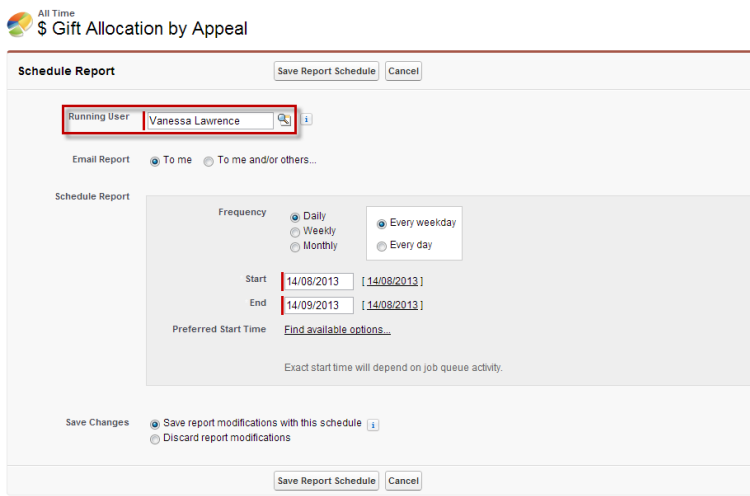 This button will open a schedule editing page specific to the report you began from. Each Causeview user has specific permissions in the application which determine what information is visible to the user. These permissions have an impact on the appearance of reports. Reports are also able to generate information specific to the user’s list of created individuals (“My Individuals”), appeals (“My Appeals”), transactions (“My Transactions”), etc. The running user for a scheduled report determines what information from Causeview will be pulled into the report in accordance with permissions and “my” entities. To select a running user, click on the magnifying glass to open a search interface for Causeview users. 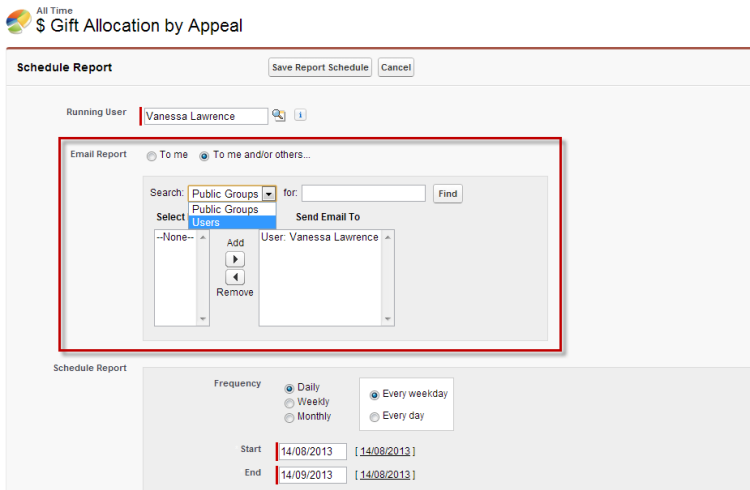 When a new report schedule is created, by default it will be emailed only to the schedule creator. To add other email recipients, select the “To me and/or others...” button in the “Email Report” field. Selecting this button will open a search interface allowing you to choose individual Causeview users or groups of users to send the report results to. Simply search for users and use the arrow buttons to add them to the “Send Email To” window. The scheduling section allows you to create a schedule on a daily, weekly, or monthly basis for a set period of time. You can even choose a prefered time of day for the report to run, although this will depend upon what other scheduled jobs are set in Causeview. 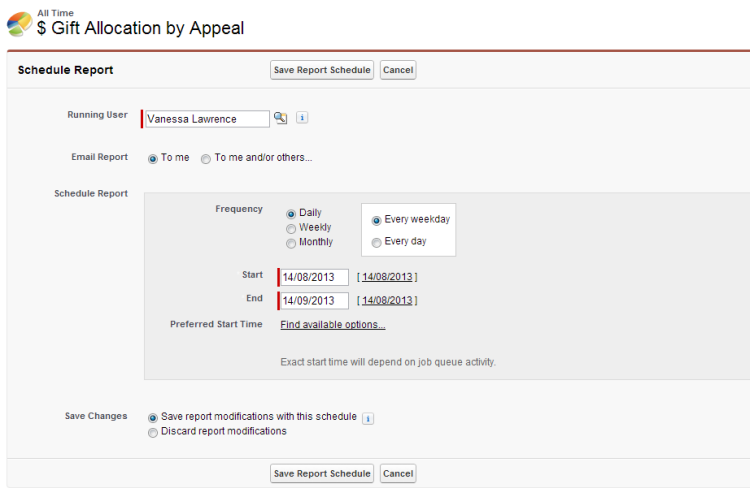 Before saving the report schedule, recall any changes you made to the report before creating the schedule. If you would like the saved report and the report schedule to include changes or adjustments you made, select “Save report modifications with this schedule”. If you would like the report and schedule to run as they were saved in the system before your adjustments, select “Discard report modifications”. 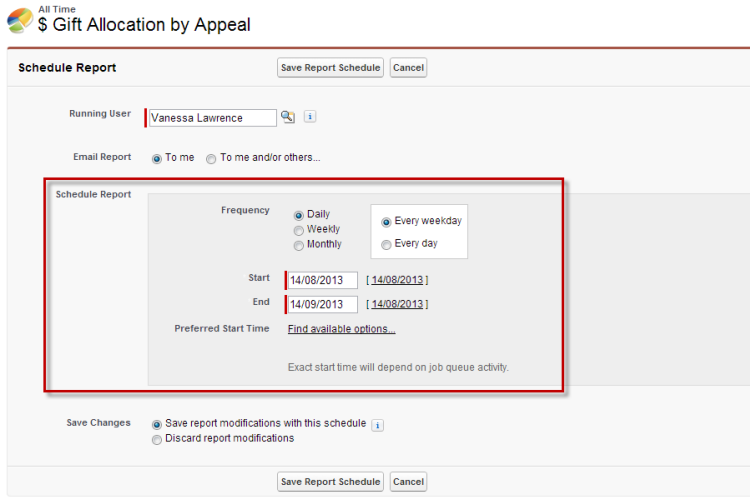 If you didn’t make any changes to the report before creating the schedule, it isn’t important which option you select. 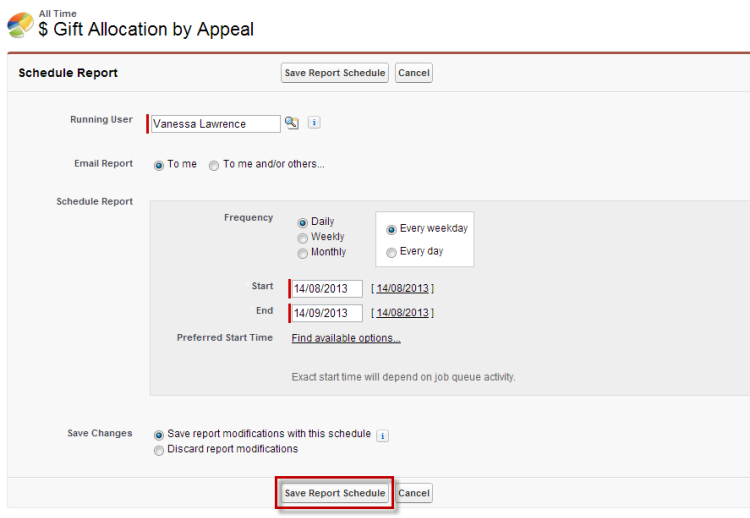 When your schedule is set up as needed, click on “Save Report Schedule” to implement the automatic schedule.